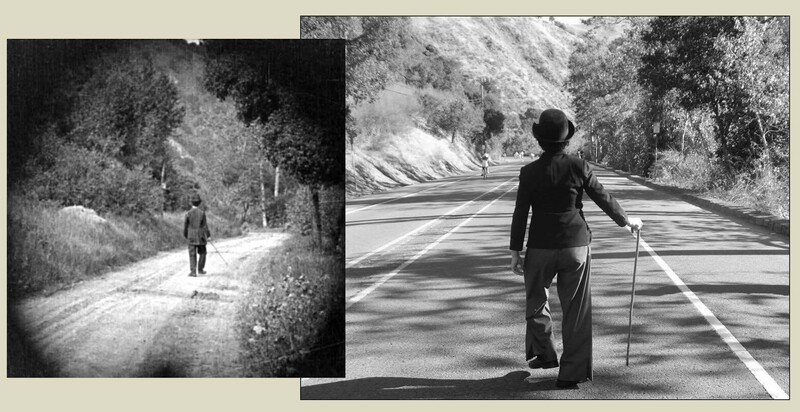 The iconic final scene from The Tramp (1915) (left) recreated in 2016 by Alani Taira (photo by Rena Azevedo Kiehn) – the opening scene below. Forever known as “the Little Tramp,” Charlie Chaplin filmed his eponymous short film The Tramp for the Essanay company over 100 years ago in Niles, California. When Chaplin arrived at the Bay Area studio early in 1915, the small rural facility had already produced dozens of comedies and westerns, many starring Chaplin’s boss and Essanay co-founder Gilbert M. “Broncho Billy” Anderson, cinema’s first cowboy star. During The Tramp, Charlie falls for a kind-hearted farm girl played by Edna Purviance, but when he learns that she has a sweetheart, Charlie sadly returns to the open road. The comedy’s bittersweet ending was novel for its time, and provides one of the most poignant and enduring images in cinema history – the Little Tramp, traipsing down a lonesome road, his back to the audience, downtrodden, but suddenly straightening up, ready for a new adventure, as the camera irises in for the final fade out. 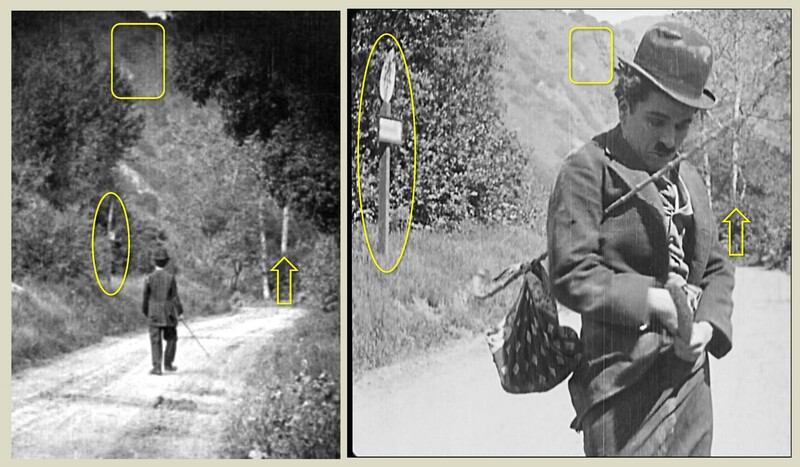 The same road sign, trees, and hillside features appear in the closing (left) and opening (right) scenes. 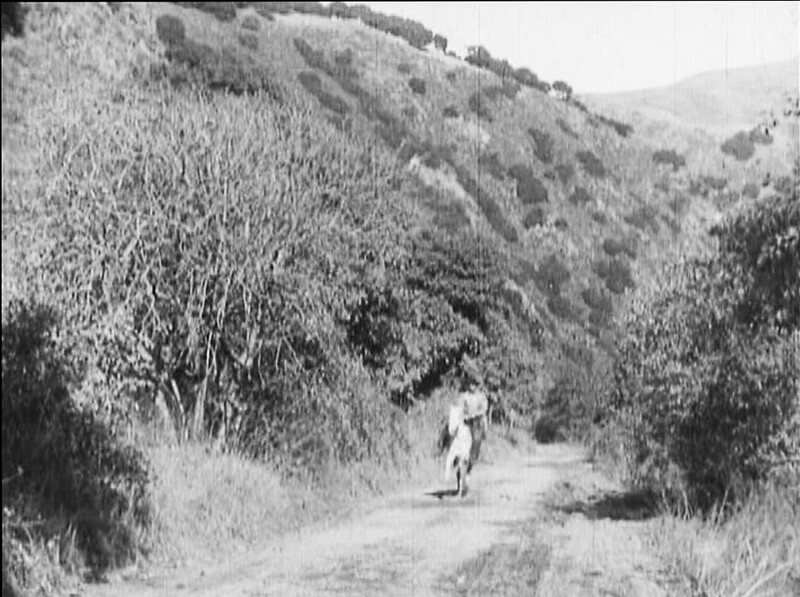 As I report in my book Silent Traces, Chaplin film location expert Gerald Smith made the incredible discovery that this lonely stretch of road can still be visited today along Niles Canyon. As shown above, it turns out that Charlie’s opening scene, dodging speeding cars, was filmed just a bit further west of the same spot as the closing scene. Click to enlarge. 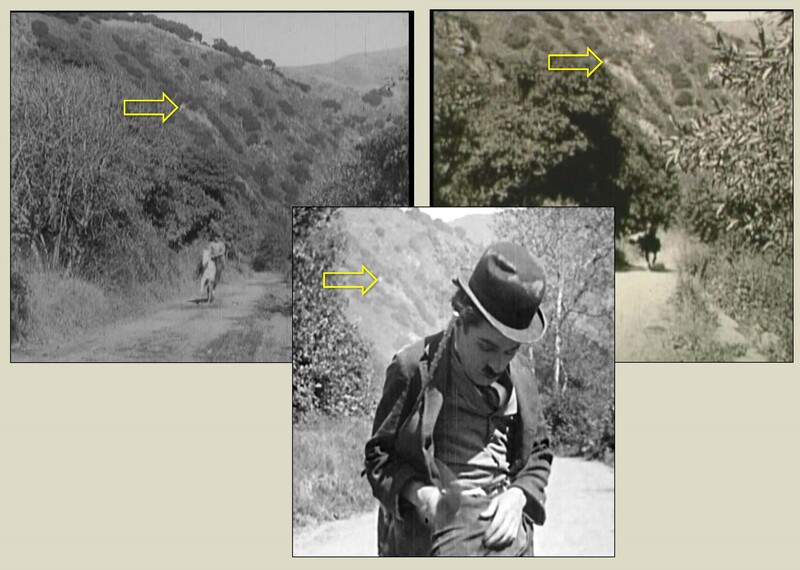 The Escape of Broncho Billy (1915) (left) and Broncho Billy’s Sentence (1915) (right), with matching hillside features as The Tramp (arrow), all filmed on Niles Canyon Road. But we now have even a broader perspective of this iconic setting. Thanks to the tireless efforts of Larry Telles, who funded and oversaw the project, the Niles Essanay Silent Film Museum has just released a wonderful two DVD set featuring 16 early Broncho Billy westerns, filmed mostly at Niles from between 1912 to 1915, and ably accompanied by talented musicians Frederick Hodges and David Drazin; Broncho Billy Anderson: Film Pioneer. This DVD marks the first time these 16 films have been available on home video, and nearly every title was transferred from a beautiful, clear print. At just $25 including tax and shipping, this fascinating two disc set offers a priceless view of early cinema, and helps support the museum’s worthy cause. Having filmed in the Niles area for years, Anderson had ample time to find his favorite places to shoot; a twist in the road here, a gully there, as clearly evidenced in these 16 films. So when it turns out that Chaplin’s iconic filming spot for The Tramp appears in Anderson’s films as well, it’s easy to imagine why. Perhaps during a lunch break, or over drinks after work at the nearby Hotel Wesley, Charlie likely mentioned to Anderson that he needed a certain setting for his latest film, and Anderson gladly obliged by recommending ‘his’ spot to Charlie. Although a busy two-lane highway today, Chaplin and Anderson’s filming spot still stands, a bit west of the blue emergency phone sign AL-84-125, along Niles Canyon Road east of town. You can purchase the new Broncho Billy DVD HERE. 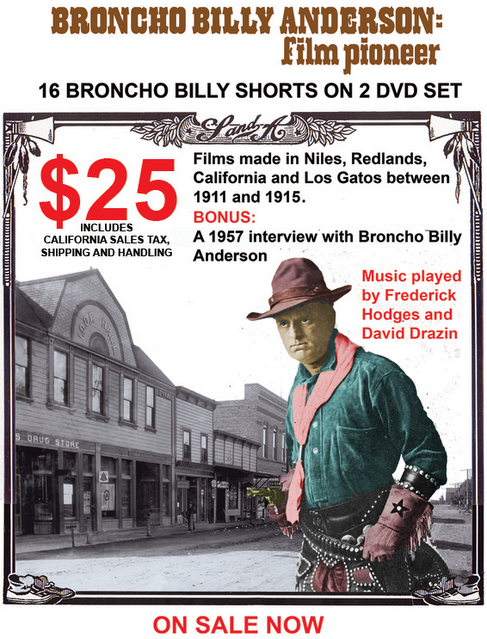 To learn more about Broncho Billy, and the Essanay studio at Niles, be sure to check out historian David Kiehn’s invaluable book Broncho Billy and the Essanay Film Company. Anderson and Chaplin were friends. 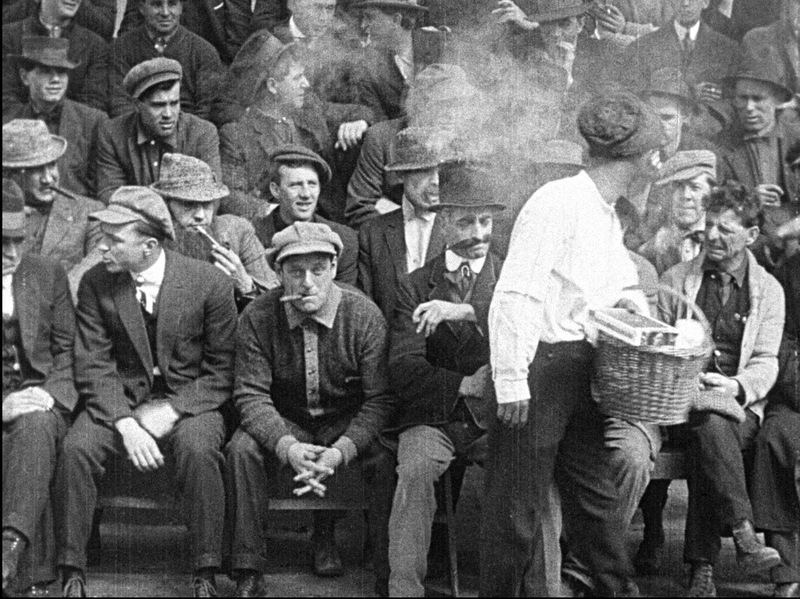 He appears here looking straight at the camera during Charlie’s boxing match in The Champion (1915). In turn, Charlie appears in Anderson’s His Regeneration (1915). 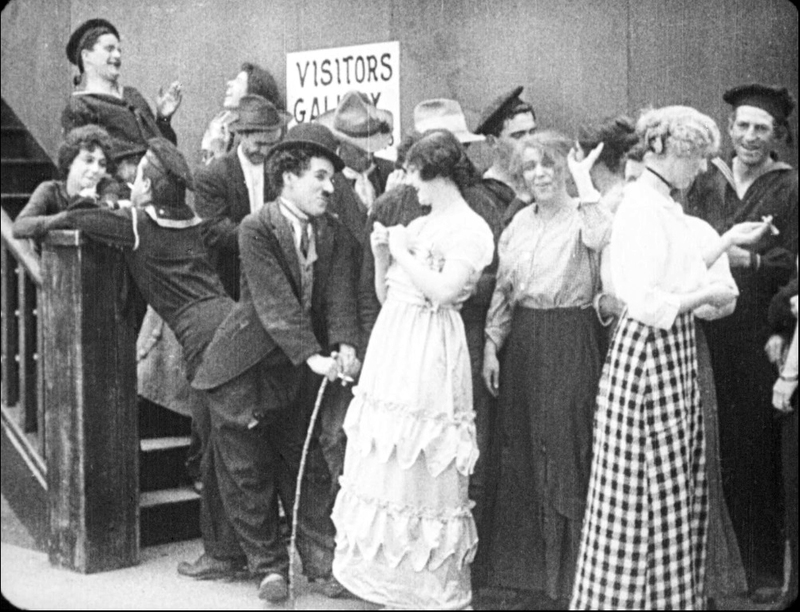 Thanks to preservationist Serge Bromberg of Lobster Films, and Cineteca di Bologna, all 15 of Chaplin’s Essanay short comedies from 1915 have been beautifully restored, available as a 5 disc Blu-ray/DVD box set from Flicker Alley. All images from Chaplin films made from 1918 onwards, copyright © Roy Export Company Establishment. CHARLES CHAPLIN, CHAPLIN, and the LITTLE TRAMP, photographs from and the names of Mr. Chaplin’s films are trademarks and/or service marks of Bubbles Incorporated SA and/or Roy Export Company Establishment. Used with permission. Where Charlie AND Broncho Billy once filmed. This entry was posted in Charlie Chaplin and tagged Broncho Billy, Broncho Billy Anderson, Charlie Chaplin, Gilbert Anderson, Niles, Niles Essanay Silent Film Museum, Silent Comedians, Silent Comedies, Silent Movie Locations, Silent Movies, The Tramp, then and now. Bookmark the permalink. Without a doubt, the most obscure find to date! wonderful new views of The “iconic final scene” from The Tramp. Wonderful ‘New’ Views of Chaplin’s final scene in The Tramp…. Love your work…..bravo, again. Thanks R.G. – more than a century has passed since Chaplin made this film, and it still touches us directly.